I’m listed along with several other beautiful blogs today here, as places to go for inspiration for your upcoming holiday tables. I have posts featuring some Thanksgiving tables here, here, and here. But I thought I may as well go a head and get the rest of my ideas up here now, since Thanksgiving is fast approaching. 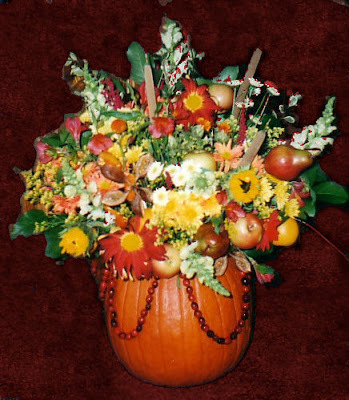 This enormous flower arrangement is one I did for Thanksgiving about 7 years ago, before I had really gotten into floral design. If I had known better what I was doing, I wouldn’t have made it SO big, but it was nice on the large serving table of our big family-reunion-style Thanksgiving. I had smaller versions on the tables using green squash. In either case, you clean out the insides well. I used Tupperware containers filled with floral oasis (wet foam) and tucked them inside. The foam makes it easy to control where the flowers, etc. go, and helps them to last longer. We just bought a bunch of mixed fall bouquets from Costco and worked with the flowers in them. I guess I really like fruit (it’s in my kitchen and previous tablescape), because I skewered a bunch of fruit to use in these arrangements. It’s nice to add something unexpected. I’ve also had good luck decorating with cranberries (except they can stain). Here I strung several cranberries end to end to make a garland, and then pinned the garland around the pumpkin. One nice thing about cranberries is that they transition well from Thanksgiving to Christmas. They look nice floating in water with candles, or as a filler in a vase or candle holder. I think I must have pumpkins on the brain this year with the baby shower and the great pumpkin pumpkin cake, because when we had our friends over for dinner on Sunday, I went with that theme. I can’t believe I didn’t get a picture of the table, but here are a few of the elements. 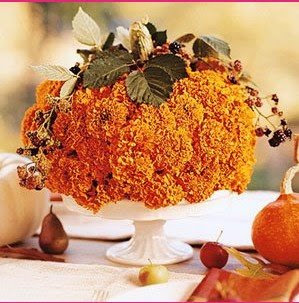 I so wanted to make this centerpiece (found here via Tip Junkie) but couldn’t find the flowers (or the time)! I may still try it for Thanksgiving. My daughter (and even my son) helped me make these pumpkin placecards. I found directions for these pumpkin placecards here, but really simplified mine. I printed the the names on the computer. Cut and folded the cards and assembled the pumpkins on top. I have a circle punch, but not an oval, so mine are shaped differently than the originals, but I think they are cute either way! I’m doing a couple of kids tables and a grown-up table for Thanksgiving, so I’m thinking I’ll stick with this pumpkin theme. How will you decorate your Thanksgiving table? p.s. I’ve been posting a lot, lately, so if you haven’t been following closely, make sure you scroll down so you don’t miss anything! Your flower arrangement is amazing! I love the pumpkin idea! How fun! Hi! Oh, your pumpkin floral arrangement is truly very beautiful. I’d say you have quite the knack with the flowers. I’m so glad I found you at Susan’s. You have a great blog. I found your flower arrangement in the first picture to be very opulent but absolutely gorgeous. Hope you have a wonderful Thanksgiving! Those pumpkin placecards are so cute! I’m out visiting Susan’s friends for Tablescape Tuesday. I love your blog–those pumpkin place cards are darling and I loved ‘lil punkin baby shower:) You have a great blog and I look forward to visiting you again. You are certainly welcome anytime at my site! Where do you find the time? Amazing. And I love the placecards…they’re so cute! I wish I had seen the cake earlier, I was looking to do one for my sons bday party, and could not find one anywhere. (keeping it in mind for next year!) 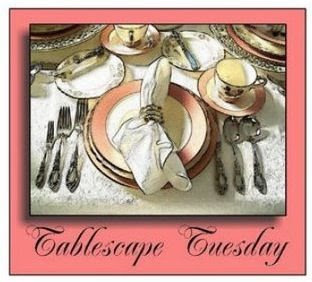 and your tablescapes are GORGEOUS, such great ideas here. I love those place cards. I can’t wait to go to all the links you have here. I always find great things here. Thanks!